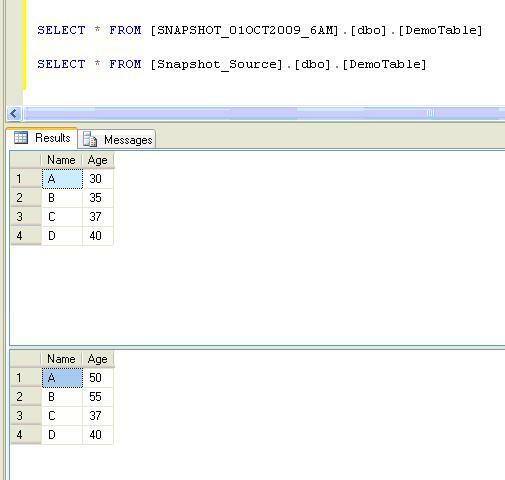 Database Snapshots is a new feature introduced in SQL Server 2005. It provides a mechanism that enables us to save an exact read only copy of a database when the snapshot was taken. It would be highly beneficial that a database snapshot is taken when certain bulk changes to the table data is made or you need to maintain an exact copy of your database as it was at the end of the day, each day. Some points to be noted while working with Database Snapshots. Database snapshot can be created using T-SQL script only, it cannot be implemented using the Management Studio. Database snapshot of a database should exist on the same SQL Instance as the Source Database. Why this is so would be beyond the point of discussion for this article, so I would explain in another blog soon. It is available only in Enterprise Edition of SQL Server 2005. Let’s modify the data in the source database by the following update statements. Verifying the data at the source database and also from the snapshot by running the following script in the Query Editor. You can use a database snapshot in situations which needs a continuous read only copy of the database at a point of time. For example, you have a reporting application which requires data to be available and it is ok to have the data as it was at the end of day yesterday. A scheduled database snapshot of your transaction based Database which runs after the working hours each day would be a good solution. Dropping a database snapshot is same as dropping a database, using the Drop Database command. The following command would delete the database snapshot that was used in this example. This entry was posted in SQL Server and tagged New Features, snapshots by Brumedishetty. Bookmark the permalink.